For the most part, boat name boards and similar products are custom projects. The profile for your boards, the type font style and the creation and layout of graphics -- all those considerations are for you to choose. That said, however, we also offer economical stock name board designs -- complete with your choice of several graphic art designs, all precisely engraved on our CNC machine. 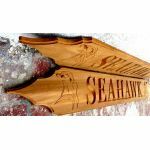 We fabricate custom engraved boat name boards using either First European Quality (FEQ) teak lumber in 1” (nominal) thickness, or King Starboard Color Core in 1/2" or 3/4" thickness. Our stock design name boards are 1/2" thick FEQ teak or 1/2" Starboard Color Core.